“Hayden the Perfect Hedgehog” from Christian Faith Publishing author Arla Jayne is the story of a Hedgehog named Hayden and his first encounter leaving Tiny Yard, where he lived with just his mom. The story is the first in a series that highlights the young hedgehog’s experience meeting someone different. “Hayden the Perfect Hedgehog”: This story chronicles the adventure of Hayden leaving his Tiny Yard to go to school in another town. He and his momma meet a toad named Johnny with a different characteristic than Hayden has ever encountered. Hayden’s momma helps him learn how to deal with other’s that are not the same. “Hayden the Perfect Hedgehog” is the creation of published author, Arla Jayne. Arla has spent thirty years in corporate America with the same company where she has lead diversity training. IT became clear that views of most adults are formed during their childhood. This experience, combined with her love of children, inspired her to educate children about diversity and acceptance. Arla is married to her wonderful husband, Ron. She has one son, who her first book honors. She was also blessed to have four beautiful, young ladies brought into her life through marriage. She cherishes being a mom to these wonderful people. Published by Christian Faith Publishing, Arla Jayne’s new book teaches young readers to accept the differences of other people. View a synopsis of “Hayden the Perfect Hedgehog” on YouTube. Consumers can purchase “Hayden the Perfect Hedgehog” at traditional brick & mortar bookstores, or online at Amazon.com, Apple iTunes store, Kobo or Barnes and Noble. 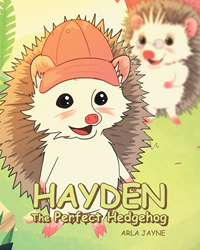 For additional information or inquiries about “Hayden the Perfect Hedgehog”, contact the Christian Faith Publishing media department at 866-554-0919.